AL FARIS transport one of the biggest and heaviest buoy in the world! 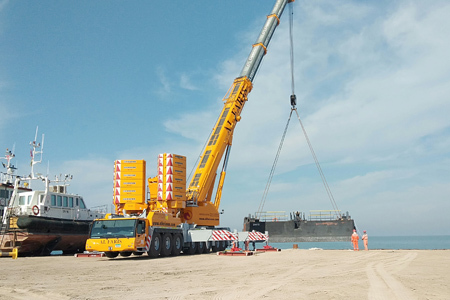 Due to Industry reputation and expertise in transporting large, abnormal loads involving high complexity in planning and execution, Al Faris were recently awarded the project of loading and transporting a turret type buoy. The buoy weighing 455t with a 18.3m diameter and 16m height is the biggest and heaviest turret type buoy to be transported on road. The load was transported using 4 files of 16 axles Goldhofer SPMT (self-propelled modular transporter) and was loaded by the self-jacking system of the trailer. A project of this nature requires exceptionally detailed planning to orchestrate the complex activities necessary for ensuring uninterrupted safe services; from route analysis to on-road safety permissions. The route was analyzed and surveyed by our technical team. The technical support documentation, execution plans, route analysis report and HSE protocols were prepared in-house and discussed with the client prior to project execution. The biggest challenge during transportation was maneuvering the SPMT with the load in narrow routes, bottle necks and sharp turns. In addition, significant diversions and managing temporary traffic routes were also a requirement in order to carry out this project successfully. Our team of engineers and technicians carried out the operation smoothly with utmost safety and efficiency. Proud to announce our new order in 2019 for 36 mobile cranes with Liebherr, worth 25 million euros. The order includes twelve cranes from the new Liebherr LRT rough terrain crane series and 4 new LTM all terrain crane series. Al Faris is one of Liebherr’s largest customers and currently has around 400 Liebherr cranes in its fleet. At Al Faris, we continuously invest in technologically advanced equipment that are cost efficient for our clients. NO COMPROMISE ON QUALITY! 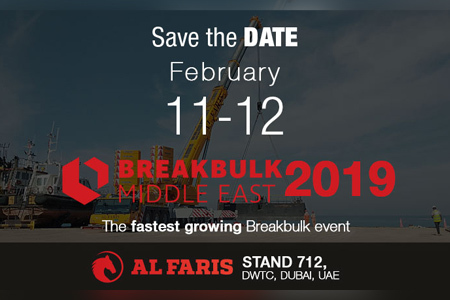 Meet our team of experts at BREAKBULK MIDDLE EAST! Stand #712, Hall 8, Dubai World Trade Centre, UAE. The first 450-tonne machine in the Middle East Region. Al Faris extends its existing crane fleet with a Liebherr mobile crane: the LTM 1450-8.1 – the first of its kind in the Middle East Region! The long telescopic boom and excellent load capacities make it easy for the all-terrain crane to lift this 60-tonne barge at a client site and is already in high demand by our customers.